Michael Gibbon has been a member of Durham Business Club for around 7 years. Michael is a big supporter of the Business Club and has inspired a lot of people to join the club over the years. Michael formerly owned Gibbon Online and ran this business for 10 years, closing it in January 2016. 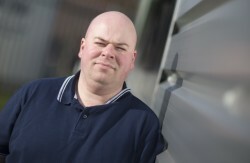 Michael Joined local business CCS in Sunderland as their IT Business Development Manager. But in May decided that he wanted to be running his own business again so has recently started Gibbon Consultancy (NE) Limited. This business will support businesses with IT and Telecoms including project management. Michael decided back in December 2015 after the death of his aunty in St Benedict’s Hospice, Sunderland he wanted to raise money for them. Michael also was aware he needed to lose weight. Since April has completely changed his lifestyle, he runs daily, including other forms of exercise, and is eating healthy. As a result of this has lost 3st of his 4st target and is training to do the Great North Run 2016 for St Benedict’s Hospice. Michael said “It’s being a challenge since I started just over 90 days ago but with consistency and determination I believe we can achieve any goal”.